Ballinacurra House is Ireland's premier private estate for exclusive hire, located close to Ireland's gourmet capital, Kinsale, in County Cork. The house was built around 1770 and underwent a major restoration during 2000 to 2003, keeping the personality of the 250 year old mansion but introducing modern conveniences and luxuries. With the owners' 25 years experience in the event management business, Ballinacurra House is internationally known as Irelands Premier Intimate Events House with a guarantee of privacy, discretion and style. It boasts an impressive list of previous clients. 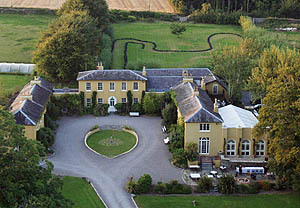 Ballinacurra House offers venues for exclusive hire, corporate meetings, team building events, golf groups, family reunions, private parties and small weddings with a difference. 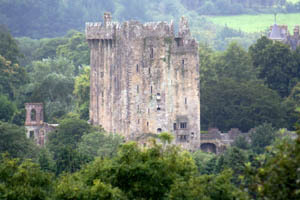 Blarney Castle is a medieval stronghold in Blarney, near Cork, Ireland, and the River Martin. The castle originally dates from before AD 1200, when a wooden structure was built on the site. Around 1210 A.D. this was replaced by a stone fortification. This in turn was destroyed in 1446, and subsequently rebuilt by Cormac MacCarthy, King of Munster. The castle is now a partial ruin with some accessible rooms and battlements. At the top of the castle, among the machicolations, lies the Stone of Eloquence, better known as the Blarney Stone. Tourists visiting Blarney Castle hang upside-down over a sheer drop to kiss the stone. There are many legends as to the origin of the stone, but some say that it was the Lia Fáil—a magical stone upon which Irish kings were crowned. It was built primarily by Hugh de Lacy and his son Walter, from the 11th century. de Lacy took possession of the present building in 1172. 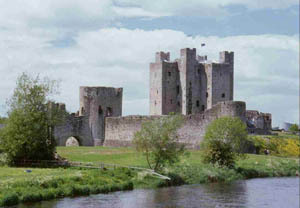 The Castle was used as a centre of Norman administration for the Liberty of Meath, one of the new administrative areas of Ireland created by Henry II of England and granted to Hugh de Lacy. During the late Middle Ages, Trim Castle, still the centre of administration for Meat, marked the outer northern boundary of The Pale.